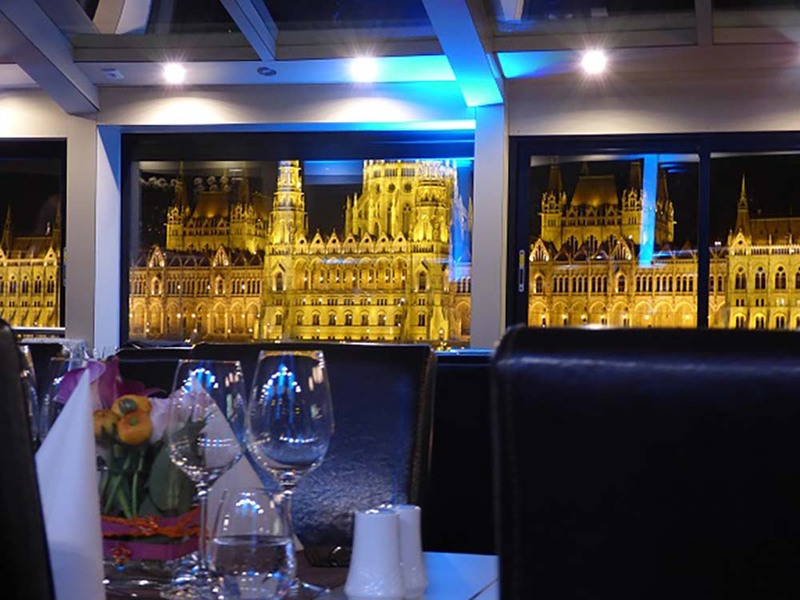 Indulge yourself in the world of our Budapest Dinner Cruise while sailing on River Danube. Indulge yourself in the world of our dinner cruise! We serve you a delicious four-course menu during our piano evening as our cruise ship smoothly moves on the waves of the Danube. The breath-taking panorama is made even more special by our piano and song performances. 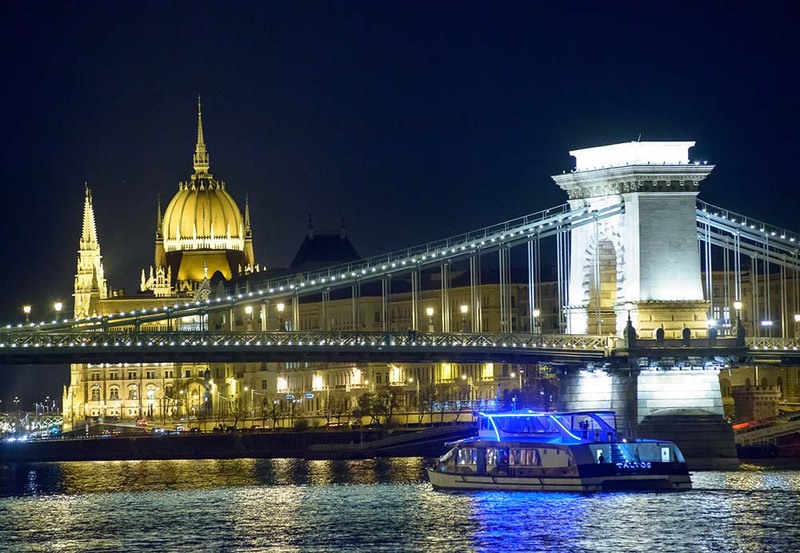 The 3-hour long Budapest dinner cruise gives you the opportunity to marvel in the most beautiful monumental buildings of Budapest from the best perspective, while our friendly waiters serve you your welcome drink and menu of choice. You can choose your soup and main course freely from our menu (vegetarian options available). The romantic atmosphere of the cruise is ensured by soft candlelight and moving melodies. 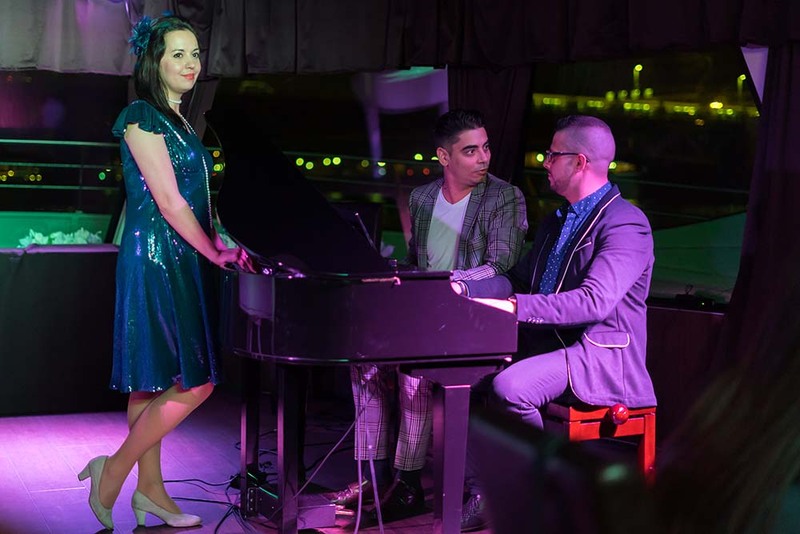 The show on our Budapest dinner cruise is performed by two brilliant pianists and a charming vocalist. The dinner is accompanied by well known, sometimes cheerful, sometimes melancholic melodies. 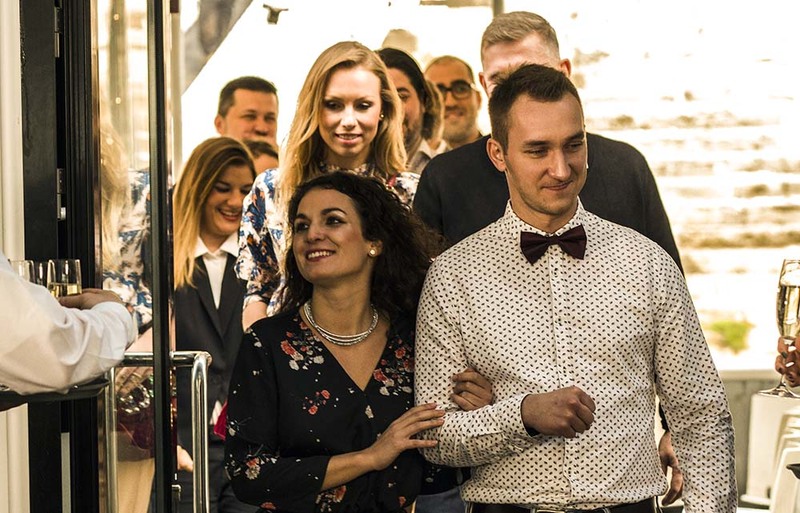 Our exceptional music-infused dinner cruise is one of the most popular activities in Budapest during the whole year, thanks to the unique and invaluable experience it gives to our dear guests. Why is it a piano battle show? The live piano show is performed by our talented musicians who play during the whole evening even alternately and even together based on the romantic love songs and well-known melodies. Sometimes the singer joins them to increase the atmosphere of the music and speed up the tension of the two competitors. Sounds good, isn't it? Sadly, after a while they always make the same mistakes, namely, they want to show to the audience their own talent, and they end up to have a nice rivalry between each other. The question is: Who's performance has more interesting melodies, who plays for the pretty lady’s favor, who plays better, who is better? 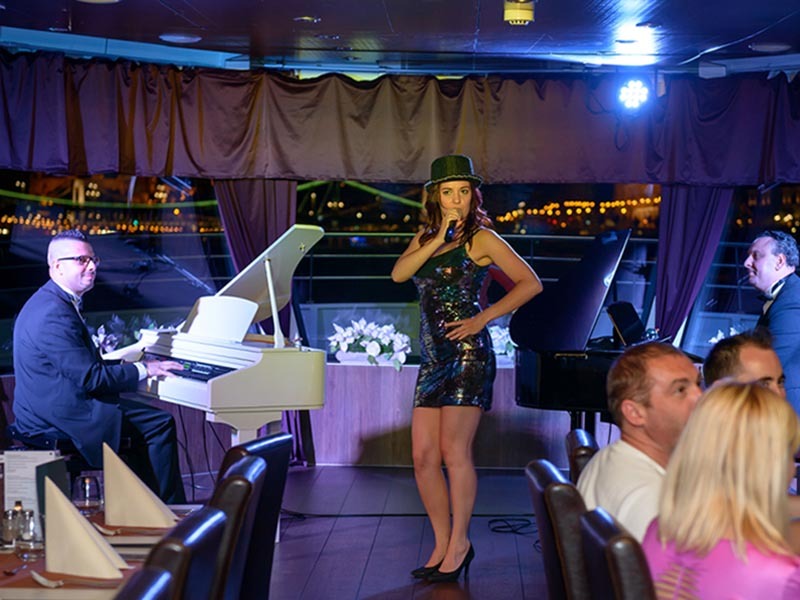 Our musicians perform you not just a boring piano night, but a real show to entertain you during the evening. Upon arrival, you are awaited by our hosts who will help you to find your table. 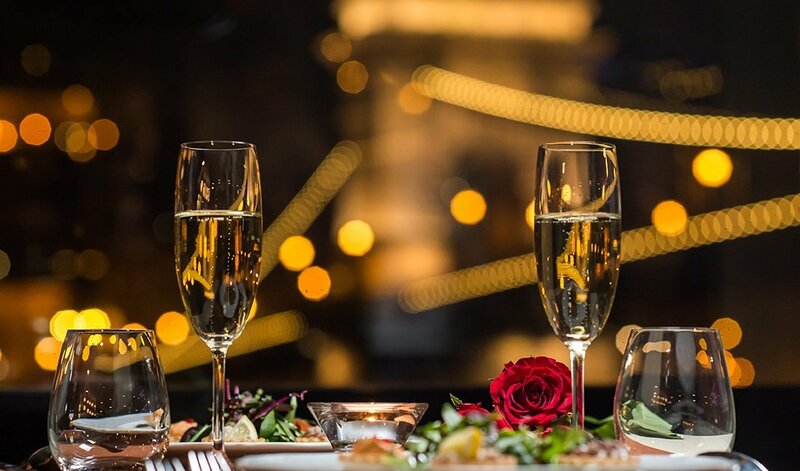 As soon as you feel comfortable we will great you with a welcome drink and while enjoying the taste of the exclusiveness you have the opportunity to check our menu card and decide what to select for each course of the 4-course dinner. After departure, the master of ceremony - who is actually the lovely host lady-, will great you and explain all the important information you have to know about the ship and about the program of the evening. She will be responsible for the good mood for the next 3 hours, this capricious lady, who can be asked for extra songs if you miss one of your favorite ones. Don't forget, the evening is for you, if you would like to sing a song for the audience, do not hesitate to ask for the opportunity. We start the evening with a welcome drink upon arrival, which will help you to decide what to choose from the menu. · Starter: even if you prefer a light salad as an appetizer or you like to experience something new, we have options for you to be satisfied. · Soup: again, vegetarian version of vegetable creme soup and traditional goulash soup to get a little touch of the Hungarian cousin. 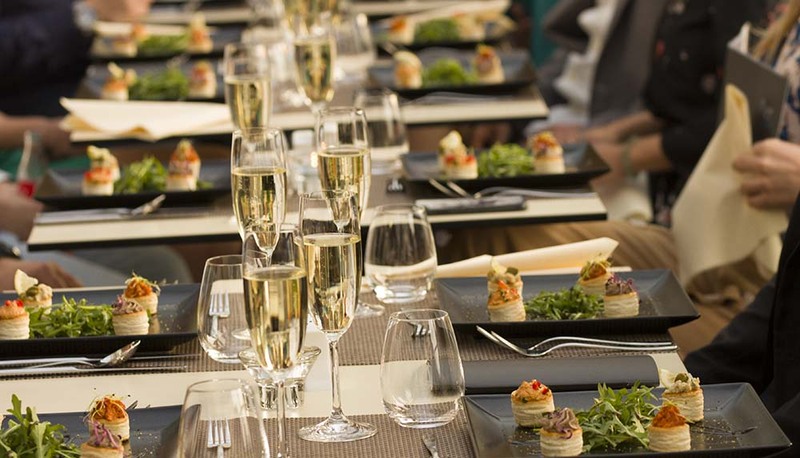 · Main course: we offer s6 different main course to choose from. Some of them are vegetarian, some of them follow the Hungarian culture. We have dishes that are proper for people with some kind of food intolerance as well. · Dessert: just like the starters, we have fruit salad for those who prefer light dessert and some cake for the sweet tooth type. In case you bought the drink package the unlimited drink of your choice will arrive soon, in case you prefer to pick something from the drink menu, you will have time to check what we can offer to you. What does the drink package include? In case you prefer not to have this drink package you can choose from the drink menu as much as you want, even a cocktail can be made for you and you have to pay only for what you have consumed during the night. We offer more than a simple sightseeing cruise, a dinner or a piano evening. Taking the most exclusive elements from all of these, we created our music-infused dinner cruise to offer quality entertainment and truly breath-taking experience. Our Budapest dinner cruise with the piano evening is a great choice for couples and families alike. Thanks to its special atmosphere it may serve as a great gift too. Treat yourself and your loved ones with an unforgettable experience. Our Piano Battle Show is a truly unique performance, full of humor and emotions. The sometimes joyful, sometimes painfully moving melodies are translated by our lovely hostess. The cruise is available every day of the week. Through the course of the river cruise, live music is played.